Co-Optimus - News - Female Gear Possible In A Theoretical Gears Of War 3? Female Gear Possible In A Theoretical Gears Of War 3? Have you ever wondered where all the women in the Gears of War universe went? Aside from the few slaves we've seen and Marcus's dispatcher love-interest Anya, there seems to be a specific shortage of the female variety. A few months ago I happened across a Gears of War comic which featured the above image on the cover, and thought to myself "That'd be so cool!" Apparently, I wasn't the only one. Though it's not confirmed - that particular Gears of War comic book, and even Cliff Bleszinski himself, have hinted that this may happen if Gears of War 3 were to begin development. "there is no such thing as Gears of War 3 at the moment. 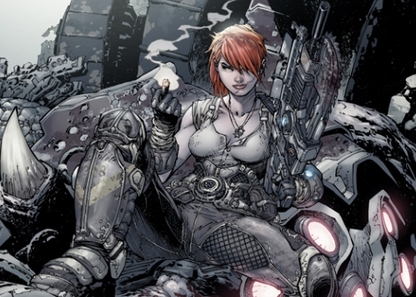 Theoretically though, if said game was to exist, Bleszinski says that the female Gear from the cover of the Gears of War comic book pictured above “may or may not” be involved in the said theoretical videogame. This doesn't really confirm if she is playable, but even if she isn't it would be nice to have another person in the game without a neck as thick as my thigh." Playable in co-op or not, having a bit more variety in those responsible for mankind's survival would be awesome. Perhaps we'll have another Horde mode with her as a playable character? All speculation of course, what do you think?